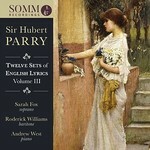 Composed between 1874 and shortly before Parry’s death in 1918, the English Lyrics come from a time of immense change as old certainties gave way to new complexity and a global war that would utterly change Britain’s standing in the world. Parry’s riposte was the English Lyrics: a defiant assertion that English poetry was the equal of Germany’s Lied and French mélodies and arguably created the template for the development of the emerging English art-song. 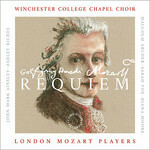 The texts of many of the 25 songs – including some of his finest – on this recording carry deeply personal meanings for Parry, his response to them as varied as mood dictates and all realised with consummate insight and craftsmanship. Settings of AP Graves, Julia Chatterton and Julian Sturgis are to the fore, although lyrics by Herbert Warner and the American poets Ralph Waldo Emerson and Langdon Elwyn Mitchell are also to be heard in a spell-binding conclusion to an acclaimed series. Parry’s only setting of Christina Rossetti, My heart is like a singing bird, is delightfully effusive, When the Sun’s Great Orb Wagner-like in its imagining of the end of days, The child and the twilight vividly full of night-time fears.